Praised by Performance Today as “one of the top young guitarists of his generation,” Jordan Dodson will soon make his debut with the Chamber Orchestra of Philadelphia in a program featuring Glow, Andrea Clearfield’s new concerto for electric guitar. On Monday, March 18 at 12:10 PM, soloist and composer visit WRTI for live music and conversation with host, Susan Lewis. Watch the performance live on WRTI’s YouTube channel here. Jordan will play several pieces for solo guitar, as well as sections from Glow, Andrea Clearfield‘s Concerto for Electric Guitar, accompanied by pianist Matthew Brower. Jordan and Andrea will talk about their collaboration on the work, which is based on abstract paintings, and Andrea’s own synesthesia. 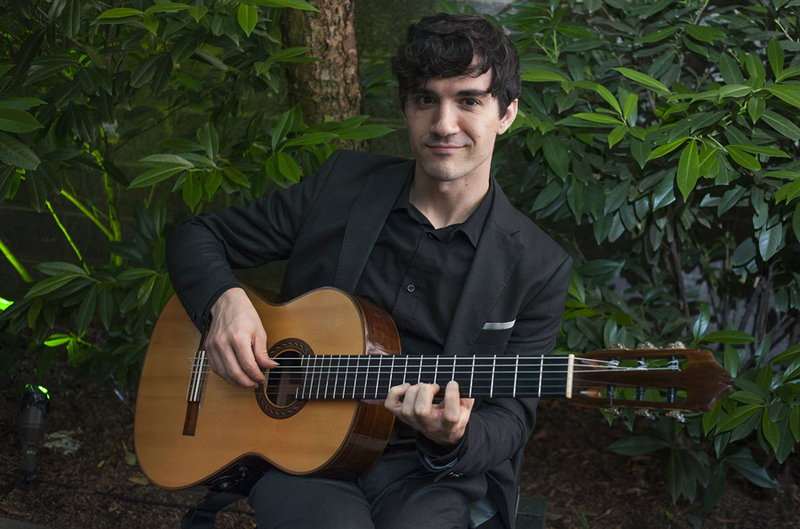 The Chamber Orchestra of Philadelphia concerts, on March 31 at 2:30 PM and April 1 at 7:30 PM at the Kimmel Center’s Perelman Theater, include Heitor Villa-Lobos’s Concerto for Guitar and feature Jordan playing both electric and accoustic guitar. Jordan Dodson is a winner of Astral Artists 2013 National Competition. Andrea Clearfield is the Steven R. Gerber Composer-in-Residence for the Chamber Orchestra’s 2018-19 season.